With just a few weeks, rather days, remaining in the United Way of West Central Mississippi’s 2018-2019 campaign, there is still plenty of work to be done, plenty of dollars yet to be raised. 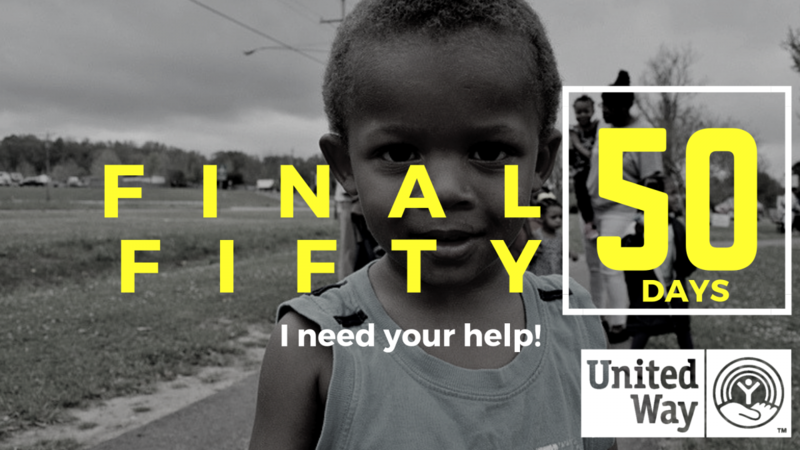 Beginning today the United Way is launching the “Final Fifty,” which is a five-week drive to generate $50,000 in campaign commitments that will go to continue to support the United Way’s 19 partner agencies and their programs. Over the final five weeks, staff from the United Way and volunteers will be crisscrossing Vicksburg, thanking those individuals and small businesses who have already committed to this year’s campaign and asking others to join in. The annual campaign ends Thursday, Feb. 28, which will fully establish just how much money can be allocated to dozens of programs aimed at helping those in the Warren, Claiborne, Issaquena, Sharkey and Yazoo counties, and Madison Parish. Over the next few weeks, you will be able to join with the United Way in celebrating those who have joined the campaign, by following the United Way of West Central Mississippi on Facebook. Like the photos we post and share those photos with your friends. Be a part of our team, our push.